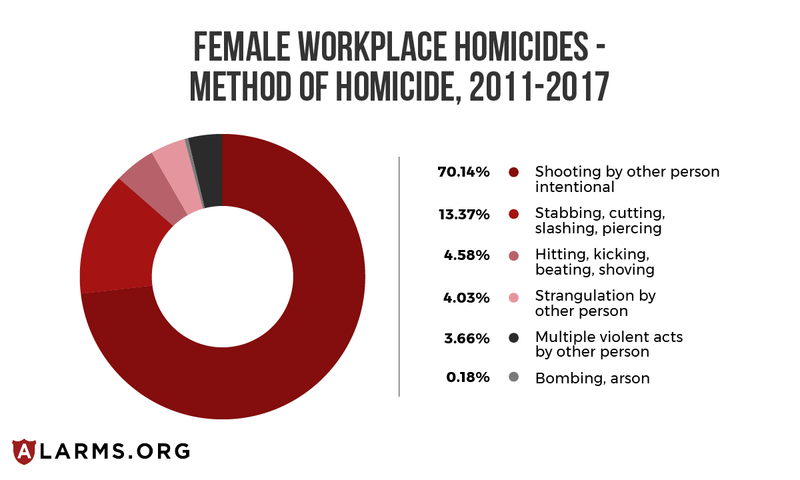 April is workplace violence awareness month and statistics show women are nearly three times more likely to be murdered on the job, compared to men. Homicides account for 22 percent of all female workplace deaths between 2011 and 2017. For men, it only accounts for eight percent of deaths on the job. 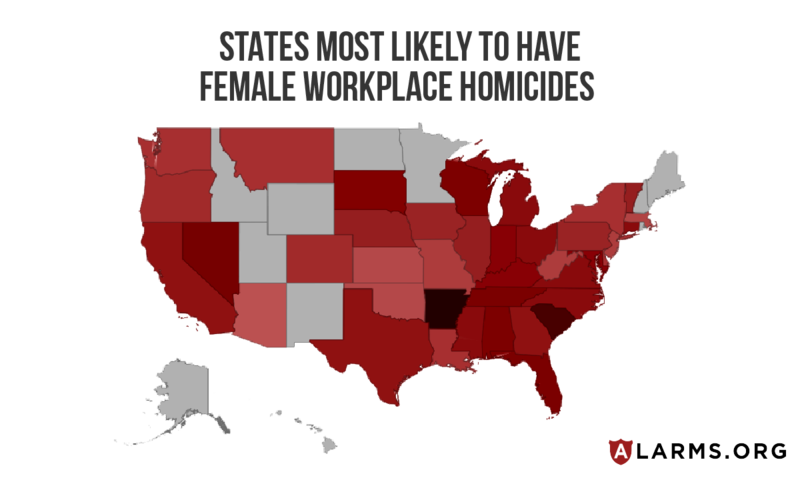 We wanted to know if any states had a higher rate of female workplace homicides. We turned to data from the Bureau of Labor Statistics, which publishes reports on all workplace deaths. We looked at homicide rates in all states between the years of 2011 and 2017, comparing those numbers to the state’s female working population for each of those years, which gave us a state’s overall score. Higher rankings mean the state scored worse. Arkansas has the highest score at 38 and saw the highest number of women killed in 2012, with five workplace homicides. In 2016, the Violence Policy Center released a report ranking Arkansas 4th for women killed by men. The VPC reports 76 percent were killed by an intimate partner. 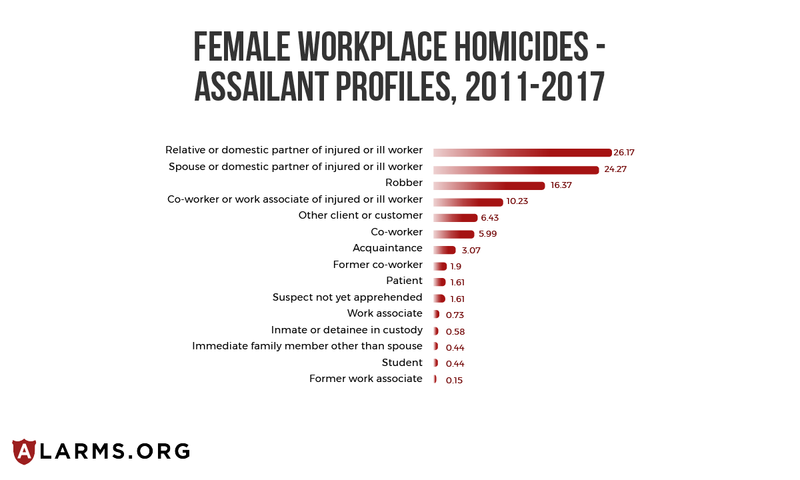 While not all female workplace homicides are committed by men, BLS numbers show there is a high rate of women killed by an intimate partner or family member. The VPC’s numbers echo this in their report. South Carolina has the second highest score of female workplace homicides at 27. South Carolina consistently had women murdered on the job every year, with the most happening in 2017. The state also has a high ranking in the Violence Policy Center’s report. It’s ranked the sixth highest state of women killed by men and consistently ranks in the top 10 in years past. However, the state points out their female homicide rates have been declining since 1998. Nevada is third on our list of female workplace homicides with a score of 18. Its highest rate was in 2012. The ranking echos the VPC’s list of women killed by men, also coming in third. Legislation is expected to be introduced this year in the Nevada Legislature with bipartisan support to crack down on domestic violence. Florida is ranked fourth, tied with Tennessee with a score of 16. Florida saw its highest rates in 2012 with 11 female workplace homicides and 2016 with 10. The state was not included in the Violence Policy Center’s rankings, as Florida does not submit data to the FBI Supplementary Homicide Report, which is where the VPC pulls its data. State lawmakers introduced a bill this year that would prohibit those convicted of a misdemeanor domestic violence crime or listed in a final domestic violence restraining order from possessing a firearm. The individual would be forced to surrender all firearms and ammunition to law enforcement. Tennessee ties with Florida for fourth with a score of 16. 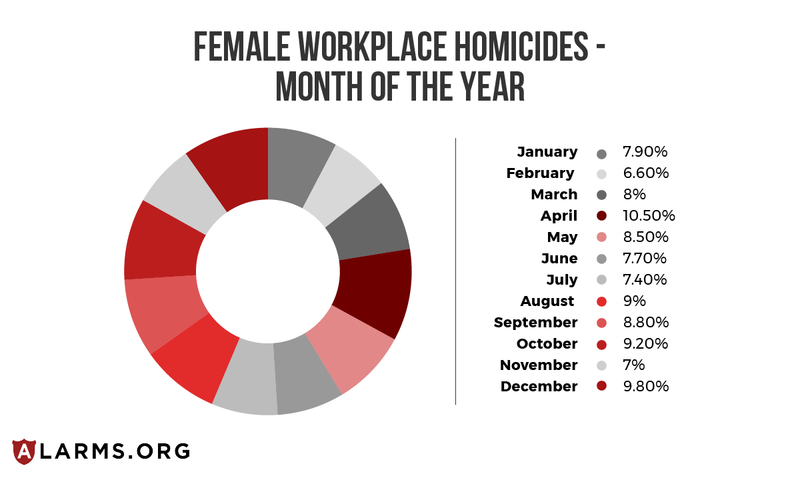 2013 is the only year Tennessee didn’t have any female workplace homicides. This ranking mirrors the Violence Policy Center ranking. The VPC reports 95 percent of women knew their killer and 61 percent were killed by an intimate partner. Just this year, Tennessee introduced the new Safe at Home Address Confidentiality Program, which redacts a domestic violence victim’s address from certain public government records. Wisconsin ranks fifth in female workplace homicides, tied with Alabama, with a score of 15. The state saw the highest rates in 2012 (five homicides), 2016 (four homicides) and 2017 (five homicides). The state had a much lower ranking when compared to the Violence Policy Center's list, coming in 21st. New data from the state released in February of 2019 show while domestic violence incidents haven't increased in the last two years, they have remained stagnant. Alabama tied with Wisconsin for fifth with a score of 15. It saw its peak numbers in 2012 (four homicides) and 2014 (four homicides). Like Florida, Alabama was not included in the Violence Policy Center's report due to its lack of reporting to the FBI Supplementary Homicide Report. In February of 2019, Alabama's Governor awarded grants totaling more than $118,000 to help domestic violence victims in 12 counties. Between 2011 and 2017, 546 women were murdered while at work. While numbers dropped significantly between 2013-2015, homicides jumped back up in 2016 and 2017. These trends are consistent with the Violence Policy Center’s numbers, which saw a spike in women killed by men in 2016. No organization or government entity has speculated as to why the numbers increased in 2016 and 2017. However in 2017, the Centers for Disease Control and Prevention started offering a package of programs aimed at fighting domestic violence culture. Part of the program targets young boys, teaching them violence is not the answer. How effective the program is or how widely it's used is not yet known. Women were most likely to be killed while at work by an intimate partner or family member, followed by robbers and co-workers. 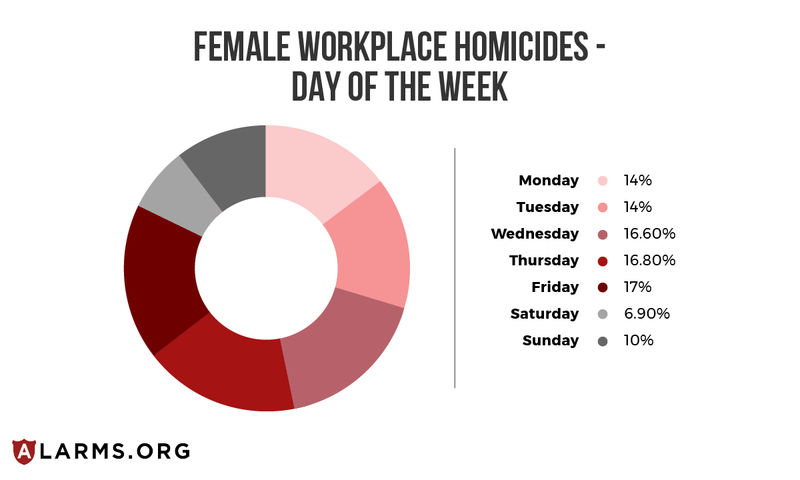 Firearms are the overwhelming weapon of choice in female workplace homicides. Guns were used in 70 percent of cases. Stabbing accounted for 13 percent of homicides followed by physical force such as beating or kicking (4.5%), multiple acts of violence (4%), strangulation (3.6%) and bombing or arson (.1%). 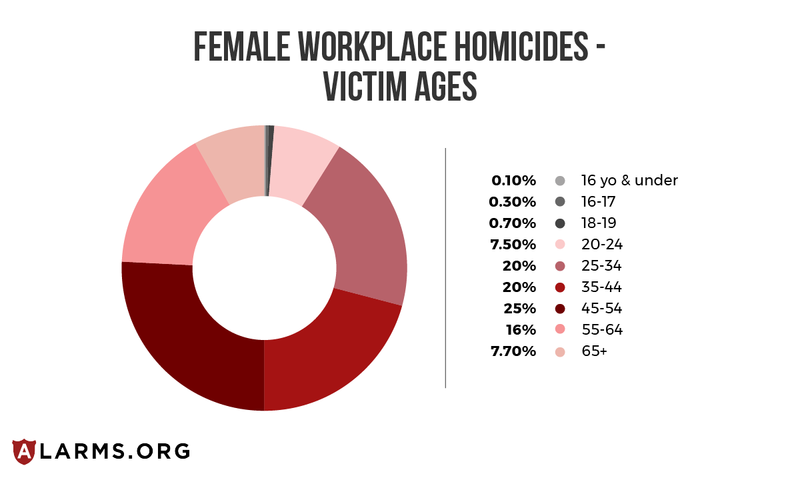 Women 45-54 years of age were most likely to be murdered at work, accounting for a quarter of all female workplace homicides. Female homicides are most likely to happen in April when compared to other months. Fridays saw the most killings, accounting for 17 percent of all homicides. The Bureau of Labor statistics uses its own occupational profiles when classifying workplace injuries and fatalities. Sales and office occupations saw the highest female homicides with 189 with high rates among my if retail workers and cashiers. Service occupations saw the second highest rate with 164 homicides, specifically personal service and food service occupations. Management occupations were the third highest at 76 homicides over the course of six years. Military and protective service occupations, such as law enforcement and correctional officers are included in the Bureau of Labor statistics but only accounted for 33 deaths between 2011 and 2016. The Bureau of Labor Statistics tracks workplace injuries and fatalities. Numbers were pulled from the ‘homicide’ classification, the killing of one person by another. Those numbers include employees who work in the field who may have been killed while away from their home office establishment but still on the job. 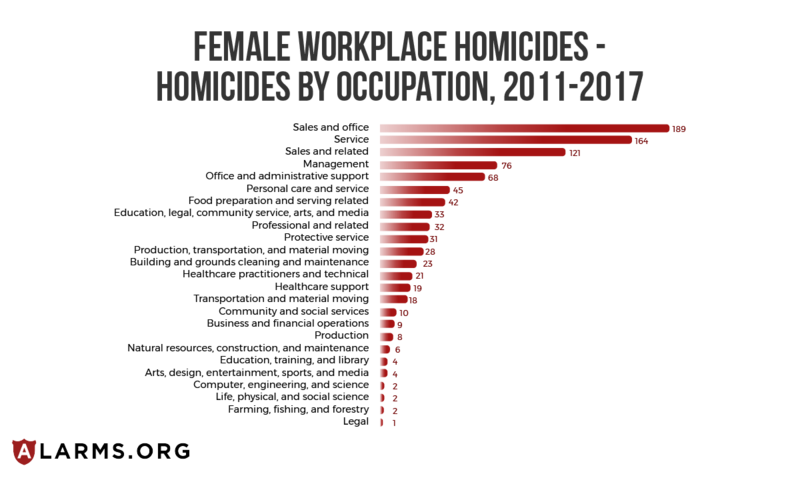 State rankings were figured by taking the number of female homicides while at work for the years 2011-2017. Those numbers were then divided by the states’ female working population over the age of 16 for each corresponding year provided by the United State Census, multiplied by 100,000 to get a per capita figure. The per capita figures for all of the years were then averaged together and multiplied by ten to achieve a whole number. States not included in this study are Alaska, Hawaii, Idaho, Maine, Minnesota, New Hampshire, New Mexico, North Dakota, Rhode Island, Utah, Vermont and Wyoming. Those states either did not report any data to the Bureau of Labor Statistics or it did not meet the department's publication criteria.